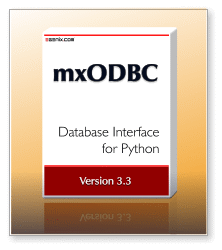 eGenix is pleased to announce the immediate availability of eGenix mxODBC™ 3.3.4 - Python ODBC Database Interface, with many advanced Python DB-API extensions and enhanced support of stored procedures with input, output and input/output parameters. Available for Python 2.4 - 2.7 on all major platforms. The various __version__ attributes in mxODBC are now automatically updated during release. In the past, we sometimes missed updating a few places when cutting releases. The complete list of changes is available on the mxODBC changelog page. mxODBC now has full support for input, output and input/output parameters in stored procedures and stored functions, allowing easy integration with existing databases systems. Added new RowFactory classes to support cursor.rowfactory and cursor.row. These allow dynamically creating row classes that provide sequence as well as mapping and attribute access to row fields - similar to what namedtuples implement, but specific to result sets. Added a new .cursortype attribute to allow adjusting and inspecting the ODBC cursor type to be used for an mxODBC cursor object. Default is to use forward-only cursors, but mxODBC also support several other useful cursor types such as static cursors with full support for result set scrolling. mxODBC now defaults to 100ns connection.timestampresolution for MS SQL Server 2008 and later, and 1ms resolution for MS SQL server 2005 and earlier. This simplifies interfacing to SQL Server timestamp columns by preventing occasional precision errors. Tested mxODBC successfully with new MS SQL Server Native Client 11 for Linux. Unicode connection strings still don't work, but everything else does. Added documentation on how to use Kerberos with mxODBC and SQL Server for authentication on both Windows and Linux. Added work-around for the Sybase ASE ODBC driver, which doesn't always pass back NULL correctly to mxODBC on 64-bit Unix systems. Added work-around for the IBM DB2 ODBC driver, which doesn't always pass back NULL correctly to mxODBC on 64-bit Unix systems. mxODBC now supports native Unicode with the recent MySQL ODBC drivers - provided you use the Unicode variants of the drivers. For the complete set of features, please have a look at the mxODBC product page. The Professional Edition, which gives full access to all mxODBC features. The Product Development Edition, which allows including mxODBC in applications you develop. For a complete overview of the available editions, please see the product page. Please visit the eGenix mxODBC product page for downloads, instructions on installation and documentation of the packages. Note that in order to use the eGenix mxODBC product, you first need to install our open-source eGenix mx Base Distribution. and then request 30-day evaluation licenses from our web-site. Users are encouraged to upgrade to this latest mxODBC release to benefit from the new features and updated ODBC driver support. We have taken special care not to introduce backwards incompatible changes, making the upgrade experience as smooth as possible. Customers who have purchased mxODBC 3.3 licenses can continue to use their licenses with this patch level release. For upgrade purchases, we will give out 20% discount coupons going from mxODBC 2.x to 3.3 and 50% coupons for upgrades from mxODBC 3.x to 3.3. Please contact the eGenix.com Sales Team with your existing license serials for details for an upgrade discount coupon. For more information on the eGenix.com Python products, licensing and download instructions, please write to sales@egenix.com.